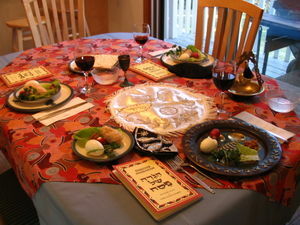 Celebrating Jesus in the "Yeshua Feasts"
The Passover and Feast of Tabernacles are two of the seven primary biblical feasts that Jews celebrate every year. But did you know that the bible actually commands not just the Jewish nation of Israel to celebrate the Feast of Tabernacles; but every nation? Every nation includes the U.S.A. and the other approximately 190 countries of the world! So what are the "Yeshua Feasts? First, "Yeshua" is the Jewish name for Jesus! What we call the "Yeshua Feasts" are the seven biblical feasts that Jesus celebrated from his youth and will also celebrate again when He returns to the earth. They are the biblical, God ordained feasts, embedded and impregnated with symbolism which speaks of God's love, His plans and expressed will for His people the Jews and yes, even the Church. He expresses His will through Jesus who is Yeshua, our Savior and Messiah! Jesus in the "Yeshua Feast"
Jesus (Yeshua) our Savior and Messiah participated in all the biblical Feasts including Passover. But did you know that what Christians call the "communion cup" at the Lord's Supper is the third cup of what Jesus used in a four part Jewish Passover Celebration? Do you know what happens in the other three parts of the Passover Celebration and its significance and impact on you today? If not....then we invite you to participate in our next Passover Celebration and Training. Time: 4 p.m. to 7:30 p.m.
Preregistration is required due to limited seating. Early registration is is advised.